Cottage Grove, Oregon is a town just off of I-5 and we’ve stopped to stay at a small RV park there several times over the years. We’d never spent time there other than an overnight stay so knew very little about the area. I happened to read that it had several covered bridges in the area so that changed my whole idea of Cottage Grove for our next visit. 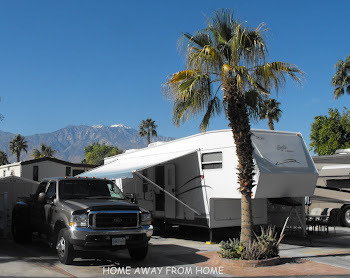 We stayed in our favorite small RV Park on arrival with the intent of staying for two nights in order to be able to visit all the covered bridges in the area. The sun was shining and the blossoms were in bloom which is not the norm when we visit, usually at a different time of year but makes for a perfect day today. I am not sure why, but I find these old covered bridges worth visiting and photographing. 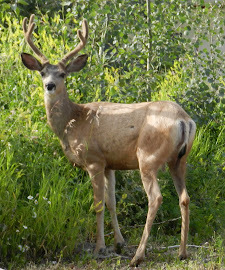 They are not a common sight in our part of the country, we’d seen them while visiting Eastern Canada but saw very few otherwise and perhaps that is why. Whatever my fascination is about, I took pictures of all of them while Keith patiently drove me all around this area in Oregon. There is really very little difference between them other than their name and slight changes in construction. Some have windows, others have not and then some had shutters, making it more attractive. Some are still in use for vehicles while others are only for foot traffic. No matter, they are all interesting and have their own charm. There seems to be several possible reasons why covered bridges were covered. They did protect the wooden bridges from deteriorating too quickly. They added support to the structure to maintain the safety for longer. It was even considered better when herding cattle across so they were not frightened by the moving water below. Whichever reason, they all sound possible to me. Our visit to Cottage Grove was at the beginning of March so the trees were only beginning to show new life but the sunshine and locations made for a fun photo shoot day. These are country roads well off of the main highway so it took a bit of map reading to find them all but we seemed to cover a lot of ground and found several. I am sure it would have been easier with a tour map but this was fun. All of the bridges found in Lane County have been rehabilitated or restored and became safe to cross whether by foot, bicycle or vehicle. The grants from Oregon Covered Bridge Program helped fund restoration for most if not all of the Covered Bridges in the area. The Dorena Covered Bridge, crosses over the Row River and the road ends here at a small park with amenities where people often gather for weddings and events. The Dorena Reservoir was engineered in 1946 and therefor the bridge needed to be built to give access to the Star Ranch, which led to the bridge often referred to as the Star Bridge, as well. The townsite of Dorena was then moved due to the Reservoir. 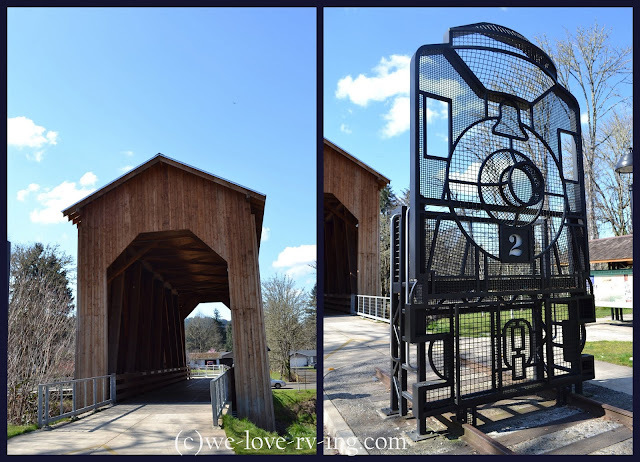 Within Cottage Grove town, they have a foot bridge that is called the Centennial Bridge built in 1987 to celebrate the 100th anniversary of Cottage Grove. Volunteers used recycled timber from two other bridges. This bridge rests on abutments from an earlier Main St. Bridge and spans 84 ft. The last train passed thru the Chambers Bridge in 1951. It became a danger to collapsing so was rebuilt in 2010 to be the only remaining covered railway bridge in Oregon and at that time, one of only eight left in the entire U.S.
We enjoyed our day of touring the covered bridges of Lane County in historic Cottage Grove, Oregon. The 48 km (30 mi) loop around the Dorena Reservoir connects them. This is the largest collection of covered bridges west of the Mississippi River, including the only remaining railroad covered bridge and they are all visited by many history buffs each year.